A survey of voters in central Ethiopia revealed opposition victory inside Oromia state and Addis Ababa city. 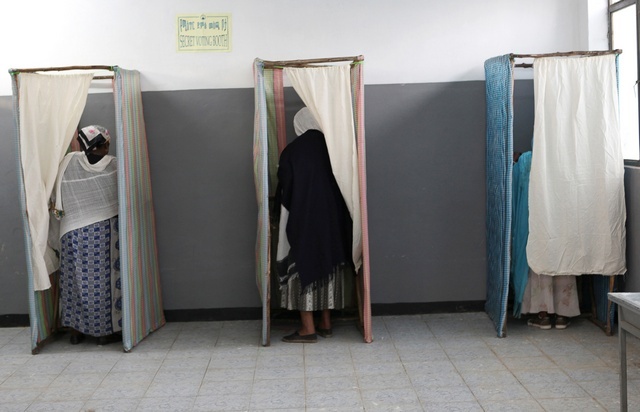 The exit poll was carried out by a coalition of university student volunteers from Addis Ababa, Jimma and Adama, the regional capital city.On Sunday, Ethiopia completed its first general election since the death of longtime prime minister Meles Zenawi. Many international experts say the EPRDF ruling party will be declared the winner since the election board is tightly controlled by the ruling party. The official votes will be counted by the election board on Monday, however independent team of college students randomly surveyed thousands of voters statewide on Sunday. The exit poll reportedly cross-examined thousands of voters from every zone of Oromia and all 10 districts/subcities of Addis Ababa. All voters surveyed were asked for their party selection, their age and their ethnicity. Allen Connelly, a western representative for the exit poll organizing group, said some voters surveyed by his group feared government spies, so the opposition&#8217;s margin of victory might be, in fact, higher than what the exit poll showed. He also said his group organized exit polls only in Addis Ababa and Oromia state because of shortage of volunteers in other states and lack of capacity. Two volunteers were arrested (then later released) by police in Dire Dawa and Ambo towns while operating the exit polls. The OFC branch of Medrek and the OPDO branch of EPRDF were the most popular parties mentioned by Oromia voters during the exit polls. The EDP, UDJ, AEUO and other small opposition parties collectively received only 21.5 percent in Oromia, according to the survey. In Addis Ababa city, the unofficial results show the opposition Blue Party won the election with 61.9 percent while the EDP, UDJ, Medrek and AEUO got a combined 30.6 percent and the ruling party EPRDF received only 7.5 percent. The AEUO and EDP parties were more popular among the older age city voters while the city youth overwhelmingly selected the Blue Party. Many Blue Party voters cited previous UDJ (Andinet party) affiliation.The demographics of urban voters showed more diversity in the capital city. Among those Addis Ababan voters who voted for all the opposition (92.5%); nearly 38% identified themselves as Amhara ethnic group, 21.5 % as mixed/Ethiopian ethnic group, 17% as Oromo ethnic group, 14.5 % as Gurage ethnic group and the rest were smaller ethnicities. Some voters complained about ballot box malfunction and many eye-witnessed opposition party election observers being harassed by the police. The majority of voters during the exit poll said they have no confidence that their vote will be counted. Official government election results are expected to become public by Wednesday.